A total of 1,198 foreclosures were initiated in Massachusetts in July – the lowest monthly level recorded so far this year, according to The Warren Group, publisher of Banker & Tradesman. Year-over-year petitions were down almost 17 percent in July, dropping from 1,441 petitions in July 2011. This is the fewest number of starts recorded in any month this year, beating January’s low of 1,333. Still, foreclosures are up 55 percent from a year ago. A total of 10,623 foreclosure petitions have been initiated so far this year, up from 6,856 petitions filed during the same period last year. 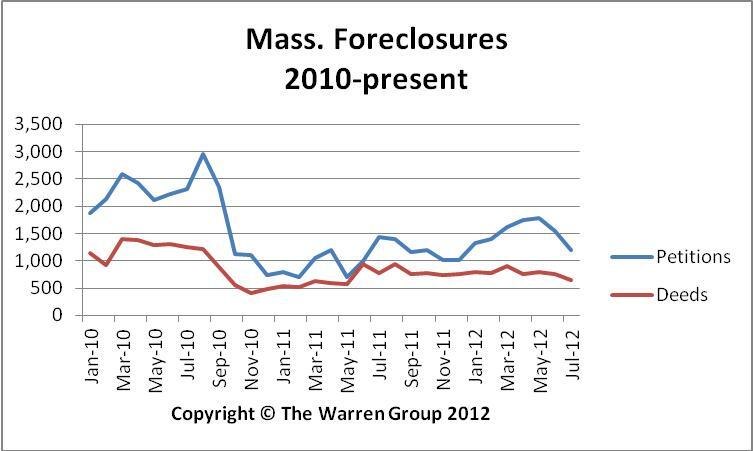 Foreclosure deeds also dropped to 648 in July, a 17 percent decrease from 782 in July 2011. This also marks the fewest number of completed foreclosures for any month this year. It is the slowest month since May 2011 when there were 571 foreclosure deeds. A total of 5,409 foreclosure deeds have been filed so far this year, an 18.5 percent increase compared to 4,564 deeds recorded during the same period last year. The number of auction announcements tracked by The Warren Group also decreased in July. Auction announcements declined 14 percent to 1,135 from 1,319 in July 2011. From January through July, 9,267 auctions have been announced, an 8 percent decline from 10,107 auctions during the same period in 2011.